(BOSTON) — The Wyss Institute for Biologically Inspired Engineering at Harvard University will lead a $9.9M multi-institutional, DARPA-funded effort including Harvard Medical School, the Mayo Clinic, Temple University, Tufts University, and Boston Children’s Hospital in order to investigate why some host organisms are tolerant to pathogenic infection, and to uncover which biological mechanisms are responsible for their resilience. 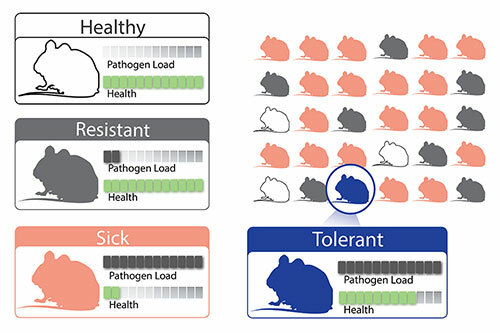 The initiative, called Technologies for Host Resilience (THoR), will search for and identify examples of tolerance across several species through experiments with clinically-relevant pathogens, and will then develop a custom bioinformatics platform to reverse engineer and pinpoint multiple therapeutic targets that could one day be potentially used to induce tolerance in humans. Selected by DARPA to lead the initiative, the Wyss Institute has expertise in modeling systemic infection and sepsis in pigs (which in 2015 led to the development of a sepsis therapeutic device), an extremely large inventory of clinically-isolated pathogens numbering more than 200 in total, and unique organs-on-chips technology that enables in vitro analysis of human organ-level responses. Led by Principal Investigator (PI) and Wyss Founding Director Donald Ingber, M.D., Ph.D., and Co-PI and Wyss Senior Staff Scientist Michael Super, Ph.D., the THoR team aims to uncover new molecular information about infection tolerance that will enable development of novel therapeutics. "There’s been recent recognition of the desperate problem of emerging infections and the rise of antibiotic resistance," said Ingber, who is also the Judah Folkman Professor of Vascular Biology at Harvard Medical School and the Vascular Biology Program at Children’s Hospital, as well as Professor of Bioengineering at Harvard’s John A. Paulson School of Engineering and Applied Sciences. "Yet, at the same time," Ingber continued, "there is always a subpopulation of individuals who become infected but never display significant symptoms. DARPA has provided us with support to uncover how this works, with the visionary goal of developing an entirely new class of resilience-inducing therapeutics that can make everyone tolerant of infection, regardless of whether it’s multidrug resistant bacteria, influenza, or Ebola." Often it’s not the infections themselves, but the inflammatory cascade of symptoms they trigger that leads to life-threatening complications associated with infections such as sepsis, organ injury, and even death. The team envisions that THoR could lead to new therapeutics that could one day protect patients from developing symptoms stemming from many different kinds of infections, while also allowing them to more quickly clear pathogens from their bodies. "It’s such a new approach to fighting pathogen infection — something that’s never been done before — and it’s incredibly exciting to be leveraging our expertise in modeling sepsis infection to make new discoveries about how some individuals or species fare better than others in the face of infection, and then apply this knowledge to develop novel therapies," said Super. The THoR team will search across multiple species, including human, mouse, pig and frog, for tolerance-inducing biological mechanisms. To do so they will utilize organs-on-chips technology to compare how the microbiomes in human versus mouse guts influence tolerance to infection, and collect data using a pig infection model to identify and study tolerant individuals. Additionally, the team will develop the first-ever high-throughput screening method in frog embryos to screen for tolerance-inducing mechanisms. Frogs share common regulatory and immune systems with humans and other higher order organisms — because of this it’s possible to screen through their embryos for a broad range of pathogens and thousands of potential therapeutic compounds much faster than using other experimental models. A predictive and unified analysis platform based on integrated bioinformatics algorithms and modeling approaches will be developed to crunch through the voluminous experimental data generated by the team. These efforts will be led by co-investigator and Wyss Core Faculty member James Collins, Ph.D., who is also the Termeer Professor of Medical Engineering & Science and Professor of Biological Engineering at the Massachusetts Institute of Technology’s Department of Biological Engineering. "We intend to collect different kinds of high-throughput biomolecular data to identify the genetic and metabolic factors mediating tolerance in multiple higher organisms," said Collins. "From these comparative analyses, we ultimately want to understand how tolerance arises in humans. Our integrated systems approach is centered around the notion that biological networks underlie the tolerant responses of higher organisms to infections." In addition to Ingber, Super, and Collins, other collaborators playing key roles in THoR will include: Dennis Kasper, M.D., the William Ellery Channing Professor of Medicine at Brigham and Women’s Hospital and Professor of Microbiology and Immunobiology at HMS, who will assist in characterizing tolerance in human and mouse gut-on-a-chip devices; Hu Li, Ph.D., Department of Molecular Pharmacology and Experimental Therapeutics at the Mayo Clinic’s Center for Individualized Medicine, who will develop and apply systems biology and network approaches to identify underlying regulatory mechanisms of tolerance from THoR data; Zoran Obradovic, Ph.D., the Laura H. Carnell Professor of Data Analytics, Director of the Center for Data Analytics and Biomedical Informatics, and Professor of Computer and Information Sciences at Temple University, who will develop predictive methods to characterize tolerance across multiple organisms; and Mike Levin, Ph.D., the Vannevar Bush Professor and Director of the Allen Discovery Center at Tufts and the Tufts University Center for Regenerative and Developmental Biology, who will investigate bioelectric mechanisms of tolerance and immune response and develop biophysical probes for characterizing tolerance in frog embryos.